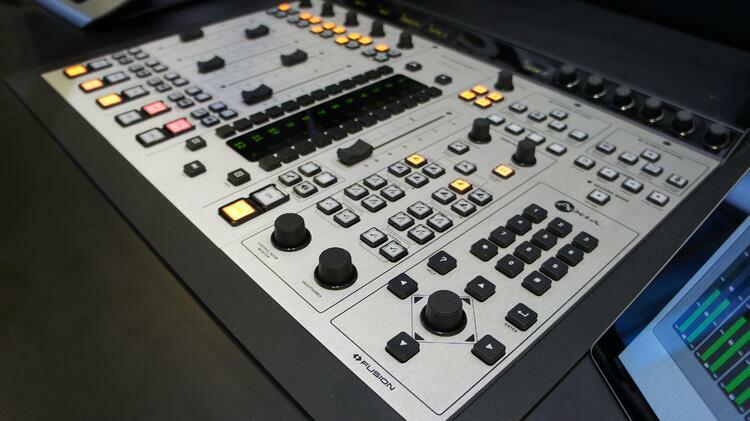 Axia designed the Fusion console with several things in mind: build quality to drool over, incredible intelligence that makes even newbs seem like experts, and perhaps what broadcast engineers value most, total flexibility. With features and capabilities informed by its rich IP-Audio experience, this is Axia's flagship surface, available in frame sizes to support consoles of 8 to 40 faders in single or multiple linked frames. However, Telos Alliance has always prided itself on a business model that allows broadcasters to continually improve the products they own rather than buy completely new units every time an improvement or innovation is made. That's why Fusion is evolving. Case in point: three new products introduced in the last couple of months that let you customize your console in new and exciting ways, refining your studio experience based on your particular wants and needs. From left to right, Axia Fusion console flush-mounted, Axia Fusion IP-Tablet Virtual Radio software on a Windows tablet, and the Axia DESQ broadcast audio console. Virtual radio is the buzzword these days, with every broadcast audio manufacturer scrambling to be ahead of the curve with products that enable this functionality. Axia was at the forefront of this movement years ago with its SoftSurface Virtual Radio Console software for Windows, which gave broadcasters powerful real-time control of their Axia Fusion or Element mixing consoles from home, office, or anywhere with an Internet connection. Broadcasters could take direct remote control of their console, or, match SoftSurface directly to an Axia mixing engine to create a virtual console without a physical mixing surface. With our new Fusion IP-Tablet software, Axia is taking another bold step toward the virtual radio studio with even more virtualized control options. The IP-Tablet Virtual Radio software minimizes the use of a desk monitor by putting your most-used console functions on a tablet, which can be mounted inside the Fusion console itself using the IP-Tablet Fusion Mount or as a separate tablet outside the console. The IP-Tablet goes beyond simple control of the Fusion console to include additional associated Telos Alliance equipment. Software licenses are available to control Omnia VOCO 8 and Omnia.9, Telos VX and VX Prime phone systems, the Z/IP ONE codec, and, of course, Axia xNode, PowerStation, and StudioEngine. There is even a Metadata Tools license that allows you to pull metadata information from your automation system to display on the tablet screen. This is great for consolidating critical information into a central location for your board operators and on-air talent. By virtualizing control, users have everything they need right at their fingertips. The Axia Fusion Console with a module devoted to a 10-inch IP-Tablet (which takes up four fader slots) for virtual radio applications. 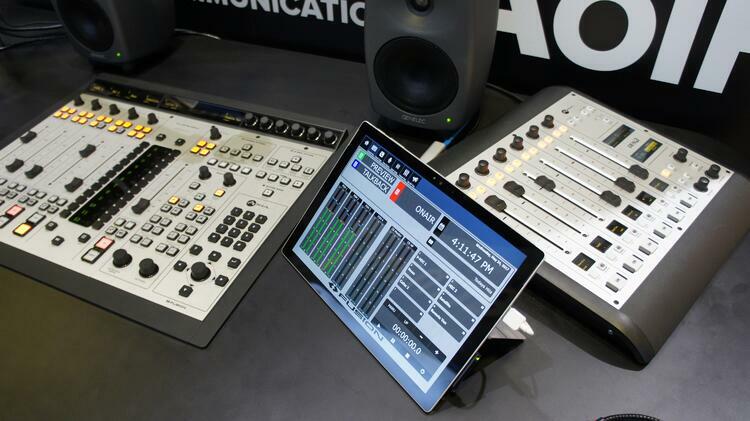 Axia IP-Tablet Virtual Radio software on Windows tablets can be used throughout your studio, putting your favorite functions and features a touch away. #2 Audio Outside of the Box: Break Free from the Console Frame! Break out of the console box with Fusion FlushMount modules. These new mainframe options allow you to mount your Fusion console into a desk for a sleek, modern, and convenient setup. Different sizes are available, which can be connected to build larger consoles. Available in 4-channel, 5-channel, 8-channel, and 12-channel versions, these modules mount directly into a desk or other furniture for a streamlined appearance that will update the look of any studio. Oh-la-la. The Axia Fusion FlushMount gives you a sleek look, while allowing you to create a console setup that follows the form of your studio furniture. The bottom image shows a series of Fusion modules, flush-mounted into a U-shaped desk. The second module from the left is the Fusion 4-fader T module, described below. Axia often develops products based directly on user feedback. Such was the case with the new Fusion 4-fader “T” module. With this module, Axia has taken its standard 4-fader module and simply redesigned the buttons to accommodate the way some customers want to use them based on their personal experience. The T module has the same functionality as the standard "S" 4-fader module (which of course, is still available), with a slightly different layout that includes Toggle On/Off, a larger Preview button, and an extra programmable button. The 4-fader T module can be used with any line, mic, hybrid, or code sources. The Rotary Options control knob can be programmed to trim source or fader gain when turned, and invokes Options screen when pressed. To customize your Axia Fusion Console with some or all of these exciting new products, contact your dealer. And please stay tuned for more news about the Axia Fusion console and other Telos Alliance innovations as they happen. If you love broadcast audio, you'll love Direct Current! Get it delivered to your inbox weekly! About Us | Press Room | Careers | Contact Us | © 1984-2018 TLS Corp.